I was not prepared to fall so hard for Rome. 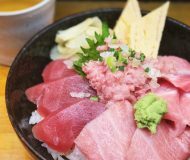 I knew that the sights were going to be beautiful, and that the food will be incredible, but until we actually got there, I didn’t realize how jaw-dropping, awe-inspiring the city would be. Rome felt like a beating heart, warm with life and history and beauty all around. Matt and I had the time of our lives. 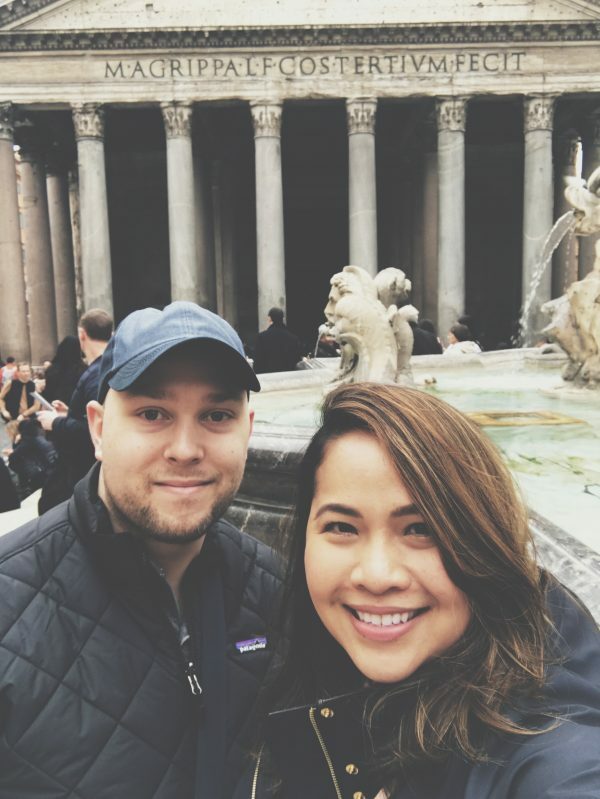 Since we got back from our honeymoon a few weeks ago, people have been asking me what was my favorite thing about Rome, and I’ve been putting off this blog post because I honestly can’t decide and didn’t know where to start! I really, really loved everything. Like, every single thing every single day. But I finally put my thoughts together and want to share my top recommendations with you guys. 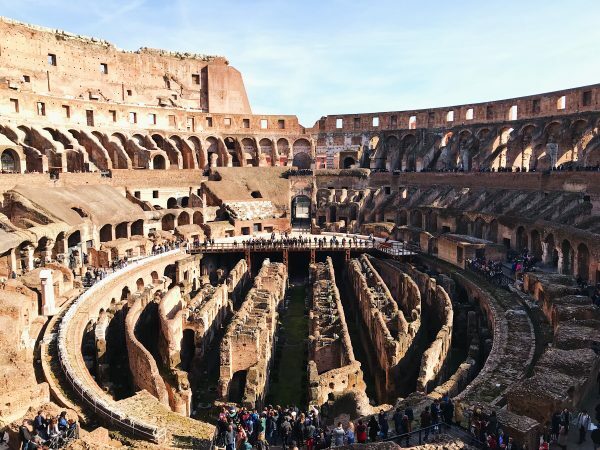 Take a tour of the Colosseum and the Roman Forum. The Colosseum, the largest ampitheather ever built, is Rome’s legendary landmark. 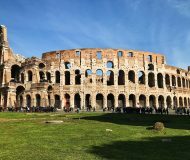 It’s really magnificent, and our appreciation for it continued to grow as we learned more about the gladiator combats, animal fights, and even mock naval engagements where the arena was flooded with water. I highly recommend booking a tour where you can skip the line with priority admission. We booked a Colosseum Underground and Ancient Rome Small Group Tour which let us visit the Colosseum’s subterranean chambers and the actual arena level where the battles were fought (most other visitors were just tracing the edges). We then climbed the Palatine Hill, which was home to the wealthiest and most powerful Romans, and then descended to the ruins of the Roman Forum, the public center of Rome politics. I was nerding out over Roman history the entire tour and I don’t even consider myself a history buff, but this glimpse into ancient Rome was undeniably the grandest thing we saw in the city. 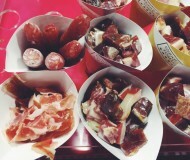 Go to a food market. 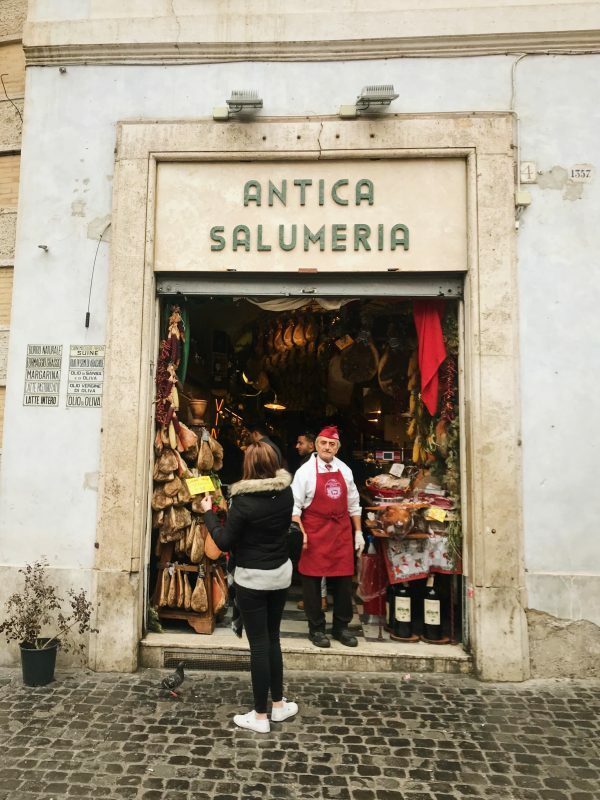 One of the reasons why the food in Rome is so delicious (really, everything we ate was perfect… okay, I had one mediocre carbonara) is the abundance of fresh and local ingredients. 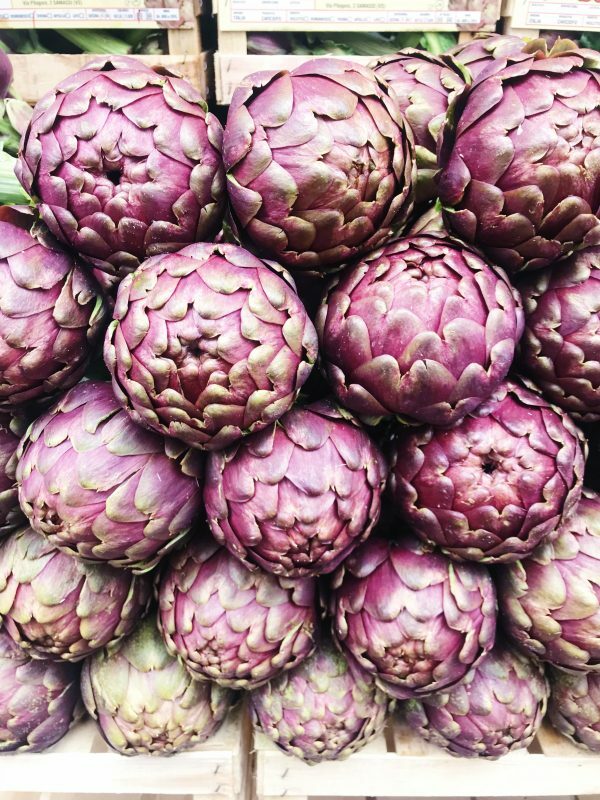 Romans always cook with what’s in season. 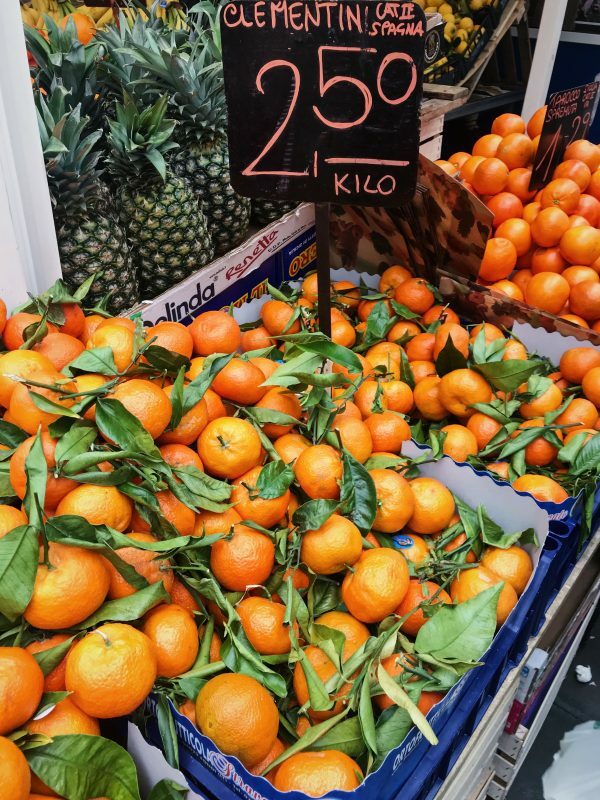 We went to the Testaccio Market and marvelled at the bright and juicy produce like artichokes and clementines. 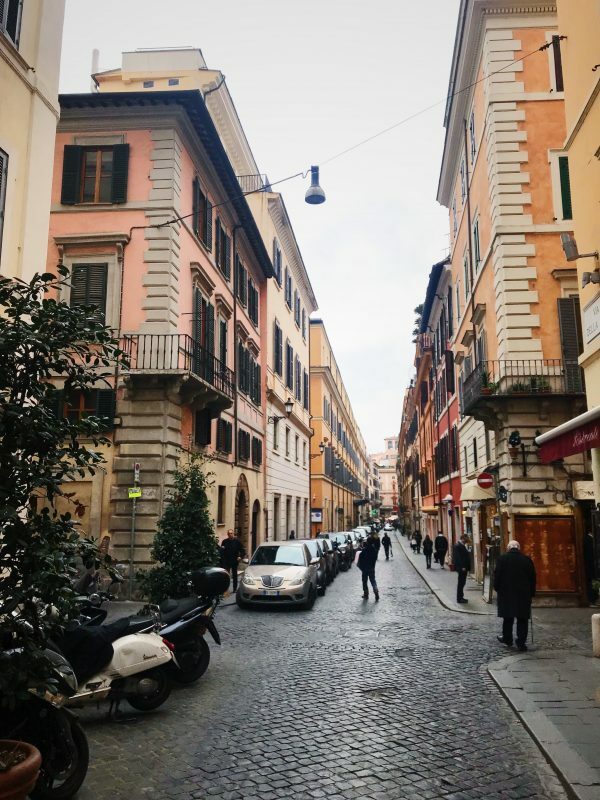 The Testaccio neighborhood is the old working class district, so it’s not necessarily the prettiest area – it’s grittier and off the beaten path. But it’s home to some really authentic food, and the people who live there take great pride in it. Eat tripe and pizza con patate. 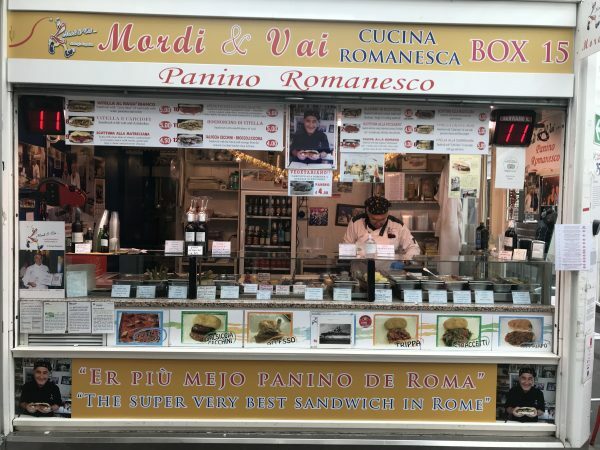 The trippa alla romana or tripe sandwich from Mordi e Vai was stuffed with tripe simmered in tomato sauce, and sprinkled with pecorino romano cheese. Some people might get turned off by the idea of eating honeycomb tripe (the lining of a cow’s stomach) but this is something I’ve eaten since childhood, since tripe is also a common ingredient in Filipino food. (My favorite preparation is in a dish called kare-kare, a meat stew with a peanut sauce and lots of vegetables, but I digress.) This tripe was delicious, and worth the trek to the market. The tripe is actually soft, each piece enveloped by thick tomato sauce. Matt had the bocconcini di vitella e carciofi, or veal morsels with artichokes. I had a bite and the meat was so tender, it was hard to distinguish between it and the artichoke pieces. 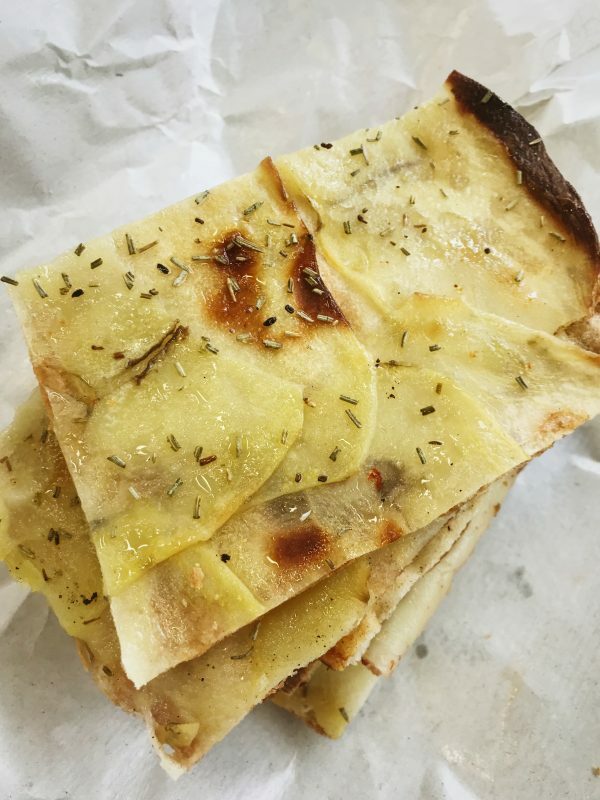 We ate traditional pizza con patate (sometimes called pizza rustica) which is a thin crust pizza with thinly sliced potatoes and rosemary. This was sublime in its simplicity. We also tried the potato pizza with mozzarella, which I also really liked. Side note on mozarella: the mozzarella in Rome is typically buffalo mozzarella (made from the milk of water buffalos) which is the same as my very favorite cheese in the world, kesong puti from the Philippines. It’s creamier and saltier than mozzarella made from cow’s milk, called fior di latte. Vatican City is the smallest state in the entire world, and it’s located within Rome. To me, the first thing that pops in my head when I hear Vatican is that’s where the Pope lives! 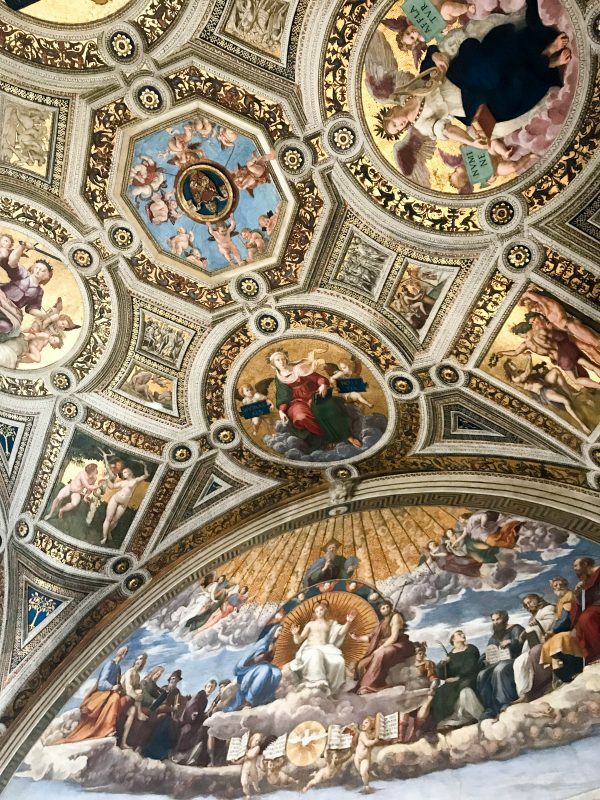 But it’s also home to some of the most well-renowned religious and cultural sites like St. Peter’s Basilica, the Sistine Chapel, and the Vatican Museums. I can say without a doubt that the Vatican Museums are the best museums I’ve ever seen. 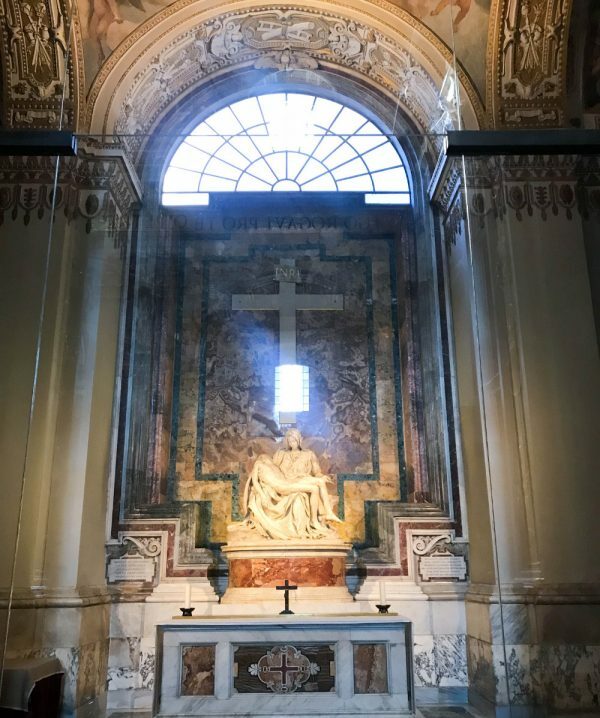 We booked a Vatican walking tour and spent several hours admiring some of the world’s most famous paintings and sculptures. I craned my neck for hours, looking up at the most intricate frescos (paintings done on wet plaster in a wall or a ceiling). I particularly loved the Raphael Rooms (pictured above) and could not help but gasp at the majestic Sistine Chapel (no pictures allowed). We also went into St. Peter’s Basilica, the largest church in the world. 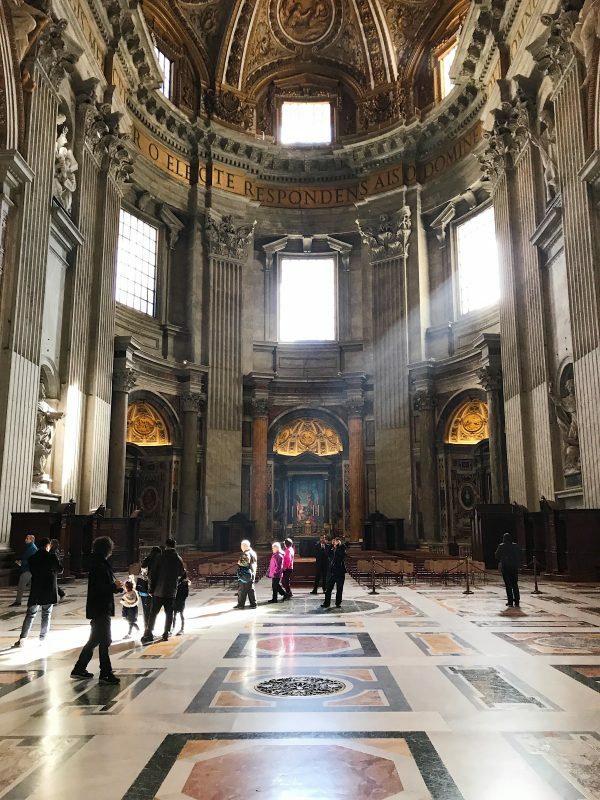 I’ve seen quite a few churches in Europe – the Sagrada Familia in Barcelona, Duomo in Florence, Batalha Monastery in Portugal, etc – but the interior of St. Peter’s is truly the most impressive, and felt more like a museum, with pieces like Michelangelo’s Pieta and other Renaissance works of art. 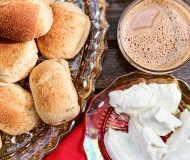 Eat Cacio e Pepe and Porchetta Sandwiches. 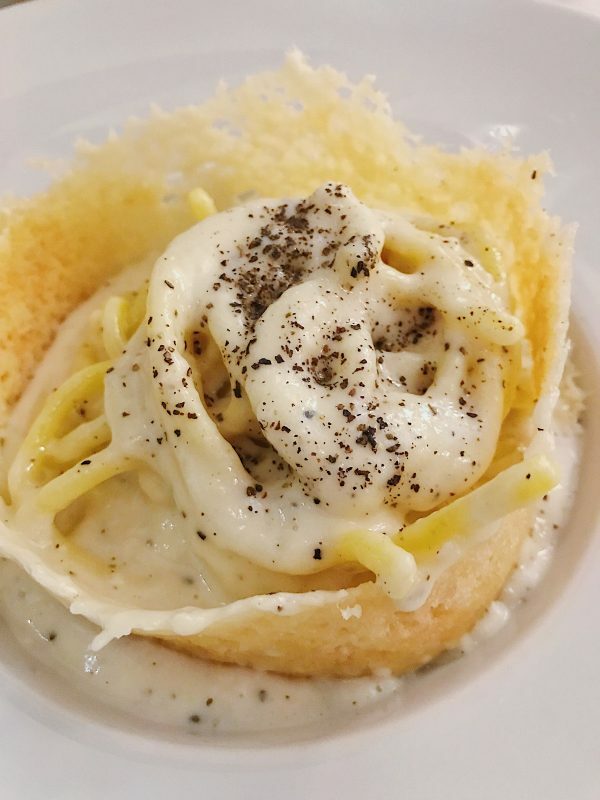 Probably one of the most iconic Roman dishes, cacio e pepe means cheese and pepper, and it’s also one of the most delicious. 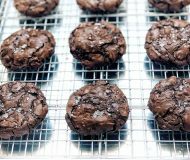 Have you ever had a first bite of something and it’s so good that your eyes roll backward? That’s me with this cacio e pepe from La Buca di Ripetta. 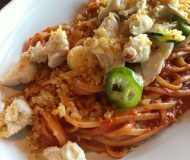 The ingredients are very simple: pasta (typically spaghetti, bucatini, or tonnarelli), pecorino cheese, and black pepper. 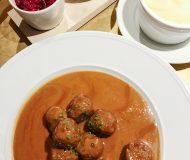 Sometimes it is served with a crispy cheese cup or cheese crisp. It’s luscious and decadent, the epitome of comfort food and vacation food in one. La Buca di Ripetta is just a few steps away from Piazza del Popolo. We frequented that area because our hotel (the wonderful Casa Montani) was just across the street, but I would still seek it out even if it was out of the way. We went there a couple of times and in our opinion it was the best restaurant we tried in Rome. Aside from the cacio e pepe, I also loved their roast suckling pig, fried artichokes, and grilled lamb chops (all traditional Roman fare). 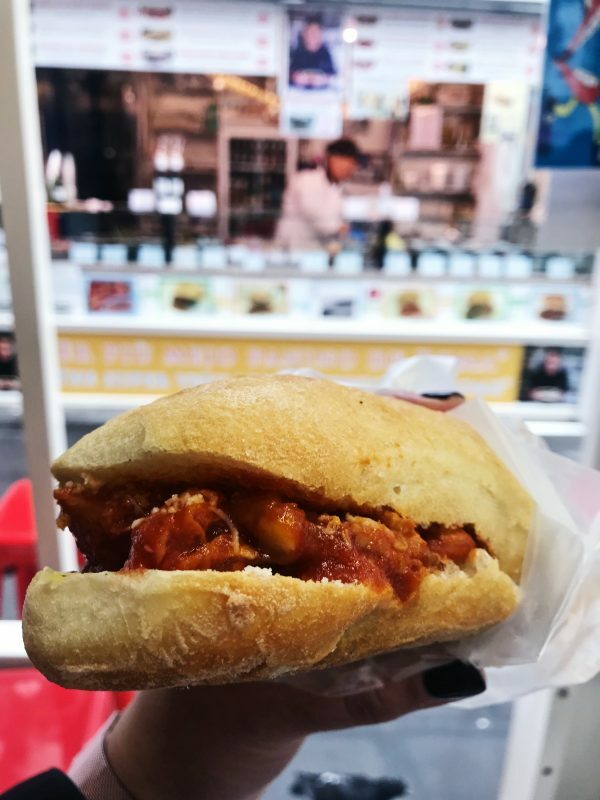 Just a minute or so from Piazza del Poppolo is a little deli place called La Vita E un Mozzico, which I also recommend that you check out for their porchetta panino (sandwich). 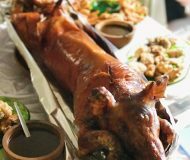 Porchetta is a roasted pork loin stuffed with rosemary, fennel, and garlic, then roasted over hot coals until the skin gets all golden brown and crackling (very much like the lechon of my dreams). It seems like porchetta sandwiches are more delicious when they come from small sandwich places, food truck, or food stalls. 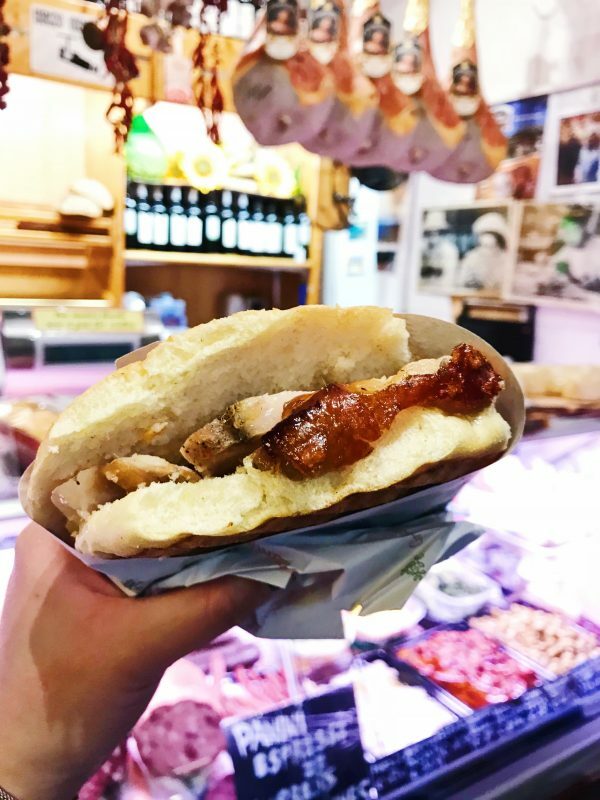 At around 5 euros each, you’ll get fluffy sandwich bread (toasted, if you like, which I always do), stuffed with a few slices of porchetta with crispy skin. Sometimes they’ll season with olive oil, salt, and pepper, sometimes with mayo, sometimes plain. Always delicious. Make a wish at the Trevi Fountain. Yes, it’s super crowded (like all other tourist attractions in Rome). And yes, it may seem like a cliche. 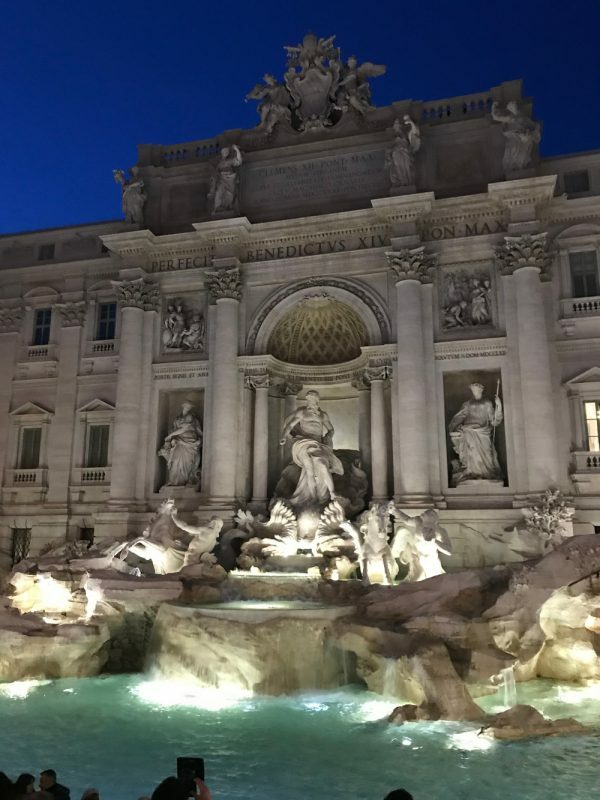 But it’s hard to resist the romance of the Fontana di Trevi, especially at night. Throw three coins in the fountain and make a wish, if only to come back to Rome again. From the Trevi Fountain, it’s only a short walk to the Spanish Steps, the widest stairway in Europe and a popular meeting spot in Rome. 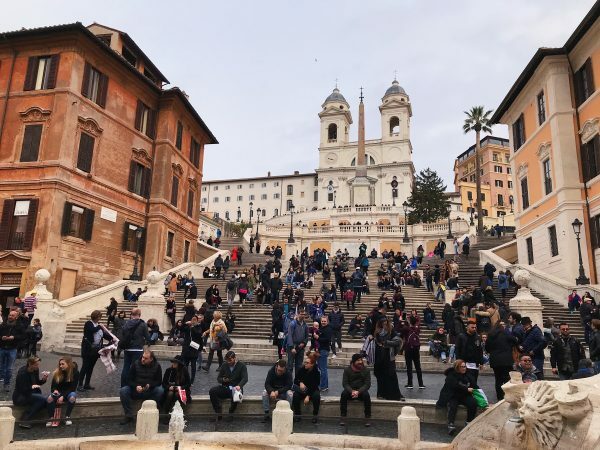 The Spanish Steps were recently completely refurbished by Bulgari, while the Trevi Fountain was restored by Fendi. I find it extra touching that Italian luxury fashion brands are invested in the restoration and maintenance of Rome’s historic sites and artistic heritage. 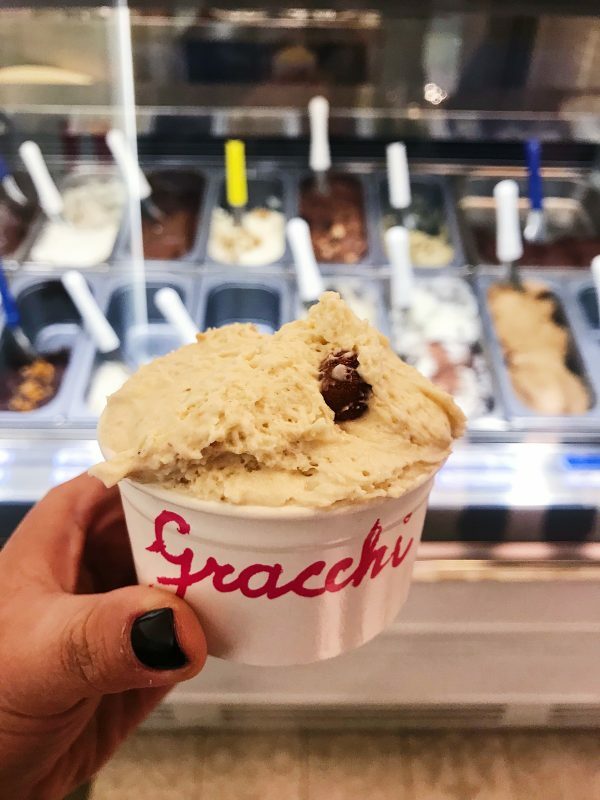 As a self-proclaimed gelato expert, my recommendation is to order one or two of the same flavors each time (I order hazelnut every time) so you can compare the many different gelato shops all over the city, decide which one you like best, and come back to that place a second time later that day. Remember that your goal is to eat gelato everyday, and this might seem like a big task, but trust me it is doable. 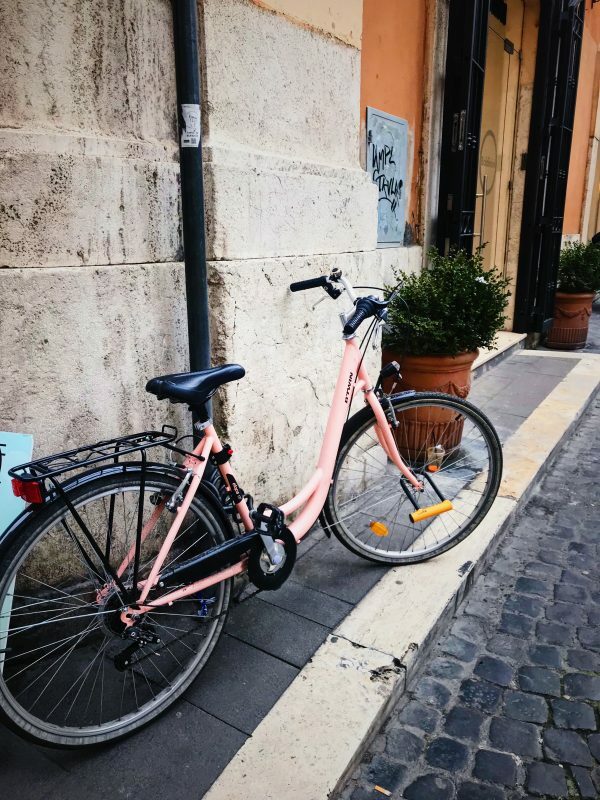 Explore the streets and sights of Rome. 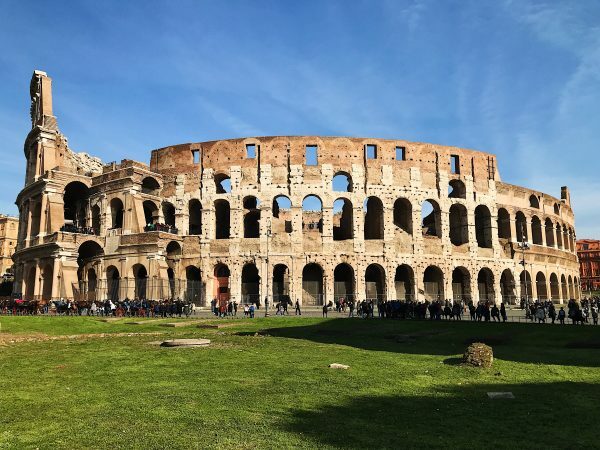 While it’s nice to make plans and a set itinerary (such as booking tours in advance), Rome is best enjoyed while leisurely walking, enjoying the streets and sights of the eternal city. I loved the color scheme of the buildings – all peach, blush pink, yellow, and orange. I loved the sight of bicycles and vespas. 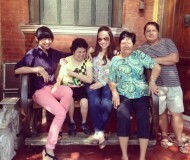 I loved the people, who I didn’t expect to be so friendly. I loved the little charming trattorias (restaurants), where we had some of the best meals of our life. Remember that Roma spelled backwards is Amor. Rome in Italian, spelled backwards, means love, and the city is brimming with it. 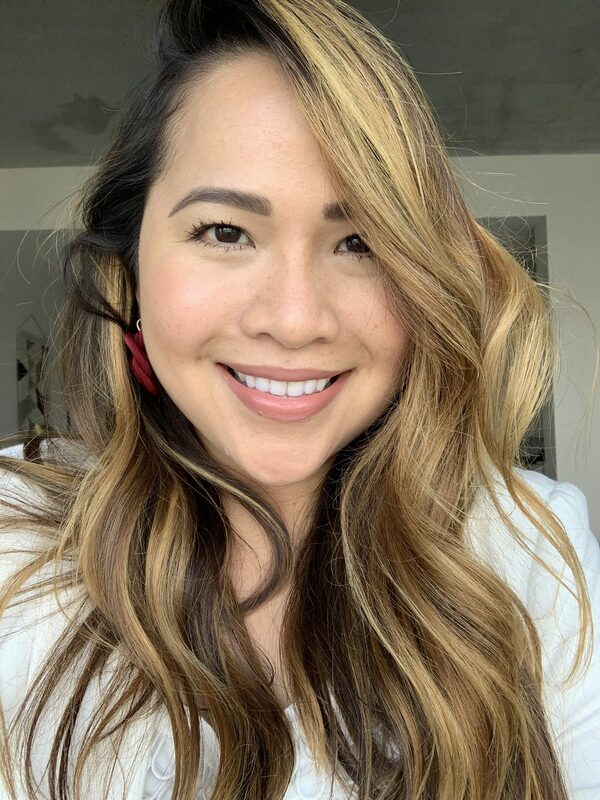 There’s so much love poured into extraordinary sites, the irresistible food, and a relaxed lifestyle that values spending time with your loved ones. 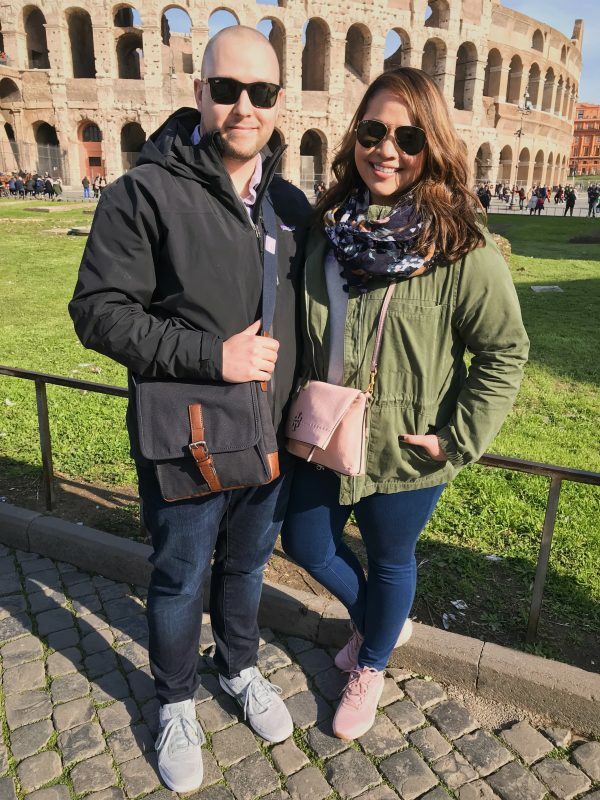 I am fortunate to visit Rome with my husband Matt, who is my best friend, favorite travel partner, and the only person to whom I would offer the last bite of tiramisu. 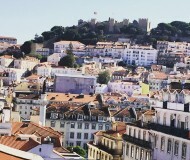 It felt magical to explore the “capital of the world” together and experience our own Roman holiday. I hope you will get to experience this, too. 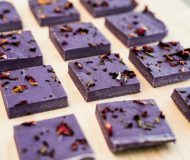 Loved reading about your travels (and eating!!) in Rome. I went for a long weekend back in 2005 and still think of it with such fond memories. Cacio e pepe is something I seek out on every Italian menu in the States. Well written piece. One can feel the thumping heart of Rome reading this. Delicious food, enthralling sights, loving company. ahhh I’m dying to go to Rome (and all of Italy)!!! Pinning this post for when I’m lucky enough to go! Thank you, Kayle!! I really hope you can go someday! My daughter and I visited Rome years ago as part of a class trip. We visited most of the sights here and we agree they’re not to be missed. Also eating from street vendors and small restaurants were so much better than the dinners organized by the tour group. And, of course, we ate gelato every day. I’d tell you about the hotel with velvet covered walls and a pink bra hanging from a tree, but doing justice to it would take too much space here. Great photos and nicely done! Hi Jeff, thank you for the comment! 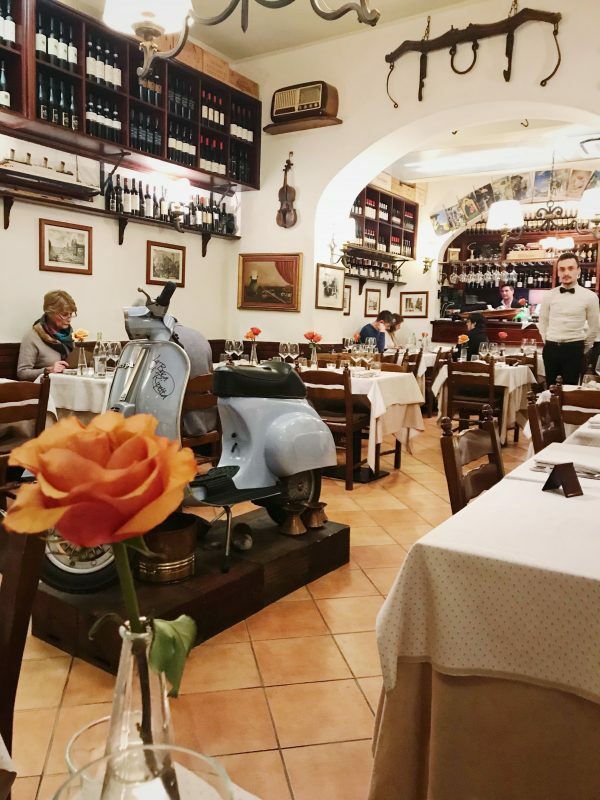 I’ve been to a few dinners with tour groups in Europe and while the food was never really bad, it really doesn’t compare to the small and intimate restaurants we stumble upon. And I love velvet but not on walls! Grazie! Wonderful piece. Well written. I felt like I was there. Now I’m hungry. Thank you <3 I'm happy to "transport" you to Rome!